What viewers saw as Mark Hateley put England 1-0 up against Mexico in 1986. We occasionally may have felt irritated by certain elements of our televised football broadcasts, but when England ventured abroad sometimes in the past we would be left thinking how lucky we were by comparison. As our commentators would be at pains to point out, the BBC or ITV had no control over what we were seeing during the match and the host broadcaster was responsible for it. There would be instances of the cameras struggling to keep up with the play, action replays still being shown while a side had a chance to score and constant shots of the home nation’s monarch or political leader instead of seeing what was happening on the field. 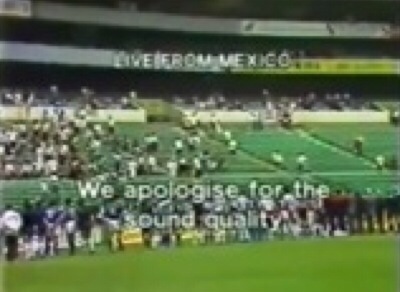 Probably the worst example of awful camerawork and directing came in May 1986, when England met Mexico in Los Angeles in a pre-World Cup friendly. 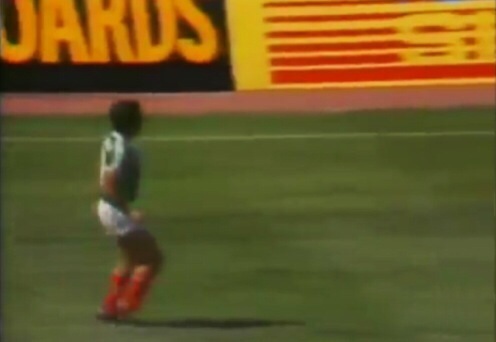 ITV showed England’s 3-0 win live, but they must have been cursing those responsible for the footage as Mark Hateley’s first goal was totally missed and his second barely seen to dreadful camerawork. At least Peter Beardsley’s effort to make it 3-0 could be properly enjoyed. Technological improvements mean when England play abroad now the commentary is as clear as back home. But for many years this wasn’t the case, with even the most distinctive of commentary voices sounding muffled. And yet it all added to the magical sense that we were watching action from a long way away and should feel privileged to do so. In June 1985 England met Italy in Mexico, with ITV showing it live. The match had particular poignancy as it would be played the week after the Heysel Disaster. But as Brian Moore began his commentary and spoke about how the meeting would help bring the nations together after the horrific events of the week before, it was almost impossible to hear him. Martin Tyler commentated from London for about 20 minutes before Moore resumed his duties via telephone. It would be an unfortunate taste of what was to come during the opening days of the World Cup in Mexico the following summer, when broadcasters from across the world were unable to get their own commentary on air. Moore must have felt he was cursed in November 1990, when ITV showed live England’s Euro ’92 qualifier against the Republic of Ireland on a windy afternoon in Dublin and he was in the commentary box. There were clearly problems from the moment the broadcast began with no sound coming through. Moore was unable to commentate on the opening couple of minutes of the match as John Helm filled in from a studio until the issue was resolved. “Brian Moore forgot to put 50p in the meter,” joked co-commentator Jimmy Greaves on the following Saturday’s Saint & Greavsie. The one thing worse than losing sound was to not be able to see the action at all. Broadcasting from thousands of miles away was an ambitious task and even into the 1990s it was not uncommon for matches on foreign soil to lose the picture feed for a couple of minutes or more, with viewers left frustrated and wondering what key moment they might miss. In the most recent blog post we recalled how ITV did not show the wondergoal by John Barnes for England against Brazil in 1984 live as they only joined the action at half-time. In the second half Mark Hateley headed in England’s second to seal a famous 2-0 win, but then moments later pictures were lost. Brian Moore (cursed again!) was left to effectively provide a radio commentary for a few minutes, as millions found their enjoyment of a great night for England slightly undermined by how little of it they had actually seen. it certainly wasnt a great night to be English in June 1993, when Graham Taylor’s side plummeted new depths with a 2-0 defeat to USA in the US Cup. ITV were once more showing it live but in the closing minutes the pictures were lost. Matt Lorenzo in the London studio joked perhaps it was just as well! Even a fledgling Sky Sports was not immune to losing pictures, as happened during a friendly in Czechoslovakia in 1992. ITV HD viewers see this rather than Steven Gerrard scoring for England at the 2010 World Cup! Forty-five years and several generations of technological advancements later, ITV would again find itself in the headlines over a missed goal. Those who had invested in high-definition television and were watching on ITV HD found an advert suddenly appearing during live coverage of England’s first match of the 2010 World Cup against USA. By the time the match was back on the screen, England were celebrating being 1-0 up. To make matters worse, there were very few other more moments of joy for England during a disappointing tournament. If ever there had been a good reason not to fork out on HD, this was it! Black and white was the order of the day as England visited Portugal in 1975! 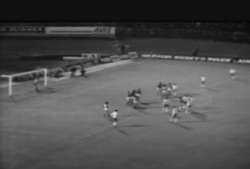 From the late 1960s, football matches were shown in colour in Britain. Not everyone could afford colour TV of course, but as the 1970s progressed growing numbers ditched the black and white sets. Yet not all countries were as quick to bring in colour television, which meant that if England played there then viewers back home would usually have to watch in black and white. Examples of this include a European Championship qualifier in Portugal in 1975 and a friendly in Argentina in 1977. I suppose it saved the commentators from having to use the “for those of you watching in black and white…” line that seemed customary at the time when describing what colours the teams were playing in! In April 1987 there was a bit of nostalgic trip for BBC viewers when the opening minutes of England’s trip to Turkey were blighted by technical problems. This meant millions back home were left watching what was effectively black and white footage of the match before colour pictures returned. The transmission problems were about the one memorable thing of a grim afternoon as England were held to a frustrating 0-0 draw, presenter Jimmy Hill joking that perhaps they should apologise for the football as well as the picture problems. The last two blog posts have recalled many of the problems faced by millions who watched England from their armchair, but we haven’t yet dealt with the personnel involved in such broadcasts who could divide opinion and leave some viewers pressing the mute button. In the near-future we will recall someone who was a mainstay of England coverage but was certainly not without his critics – Jimmy Hill.